Galaxy is a compact male with massive head and leg coverage, and solid bone. He has a perfect bite and nice temperament. He’s the perfect package with wonderful bone, density and structure. His baby photos grace the file of Snowmass Alpacas’ favorite faces file. His dam, Snowmass Chacasha, a ribbon winner herself, produces ribbon winners - Snowmass Simply Scrumptions Grand Color Champion 2008 IAO. 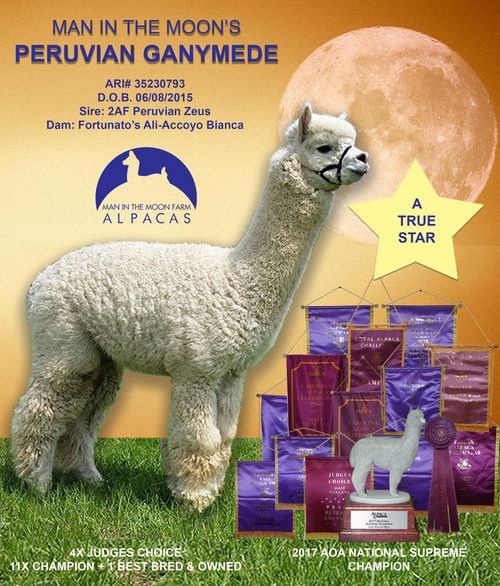 Galaxy’s sire is none-other than Snowmass Nova out of Peruvian Casanova and Snowmass Drambuie’s Kaluha. Nova is one of Snowmass’ original black premier herdsires and is a producer of champions. SNOWMASS NOVA'S GALAXY... 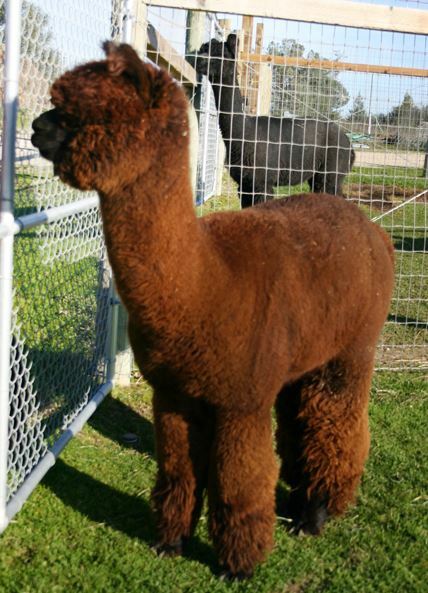 The epitome of true alpaca phenotype! Galaxy is the incredible Dark Brown/Bay Black Nova son with thick bone, massive coverage on a compact, square frame. Galaxy covers Black. SNOWMASS NOVA (His Sire), SNOWMASS CASANOVA, PERUVIAN BUENO, PERUVIAN ANGELIQUE, PERUVIAN DRAMBUIE, SNOWMASS DRAMBUIE'S KALUHA, PERUVIAN CHACCU, SNOWMASS CHACASHA (His Dam), SNOWMASS MACANTOSHA, MACINTOSH ALOA, PERUVIAN PRESTIGE. Galaxy's dam, Snowmass Chacasha (Ribbon winner) is also the dam to Snowmass Simply Scrumptious (2008 IAO Fawn Color Champion)! Kaitlyn has mostly Accoyo Lineage. Kaitlyn's maternal grandsire, 5 Peruvian Chaccu, was the 2001 AOBA National Show Blue Ribbon winner in the Get of Sire Class. 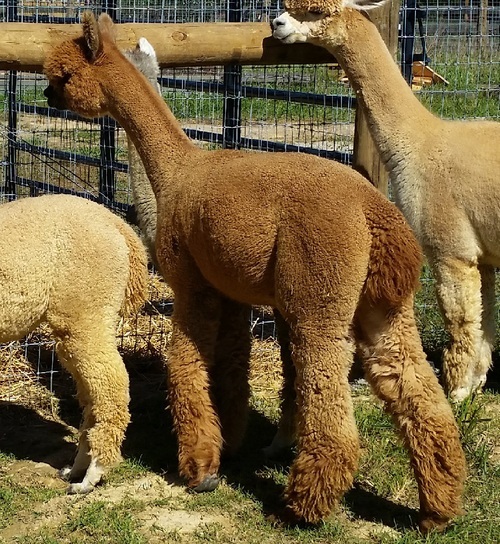 Chaccu was originally used extensively in the Snowmass Alpacas Breeding Program. Chaccu represents rare blood here in the US as he is from the Puno Region in Peru where very few genetics were released during the imports to the US. This girl has incredible presence! As we transition our herd to light, white and fawn, we are offering this exceptional foundation female for your color program at a MUCH reduced price. 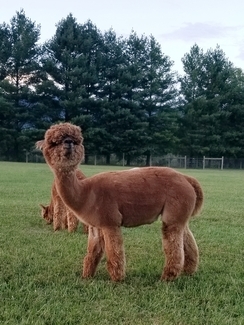 And, Estates Keltic Lass has been bred to Man in the Moon's Peruvian GANYMEDE, the 2017 AOA National Supreme Champion & 4X Judges Choice recipient, for a Spring 2019 cria! (Ultrasound confirmed on 8/14/18 & 1/17/19). We are so excited about Keltie's breeding to Ganymede, we can hardly wait - we're hoping for a fawn and expecting nothing short of spectacular! GANYMEDE has shown that he can allow color to pass through. Keltie has ribboned highly in some of the toughest shows in the country. She has a very pleasing body style with gorgeous conformation, excellent size, great head, and heavy bone. She has proven to be a very good mom, with easy birthing and plenty of milk. Keltic Lass has amazing genetics…the daughter of Snowmass Nova’s Galaxy who has incredible density and gorgeous head coverage. On her dams’ side, the genetics boast of extreme fineness with retained fineness and soft handle. Keltie's offspring thus far have all been competitive in the show ring. 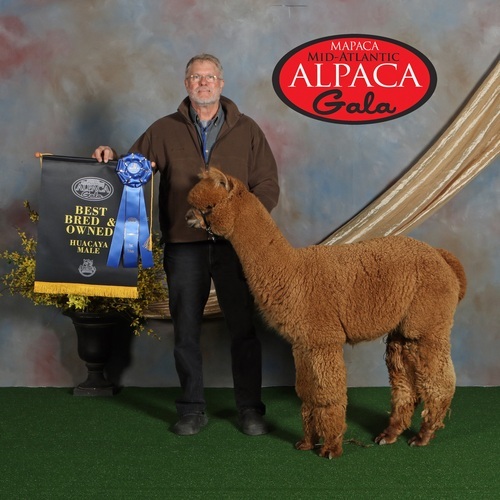 We especially love her Deimos out of TGF Freestyle, who is a gorgeous dark fawn male that garnered 1st Place and Best Bred & Owned as a yearling (19 months old) at the 2018 MAPACA show. He's been in more than one halter class where the judge indicated that every alpaca that placed had excellent fineness, character, and density, and that it was an extremely tough decision on placement. 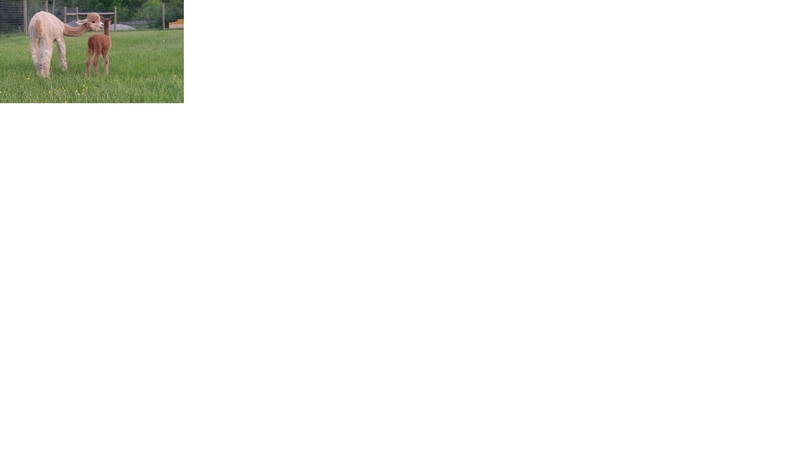 We like him so much, that he's been added to our herdsire row. Her female offspring, Mira, out of the renowned Patagonia's Lennox also did well in her shows, and she has already produced a gorgeous female cria in 2018. Mira and her cria have been purchased and just left for their new farm. 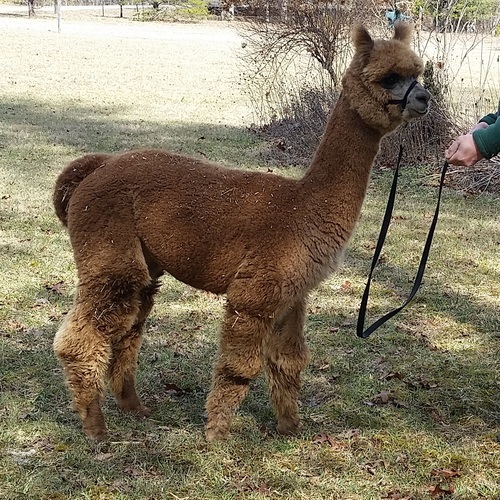 Mira's cria will be showing with her new owners in 2019. Keltie's service sire, GANYMEDE, is a phenomenal male. Norm Johnson had this to say about him: "This male shows extremely strong fiber traits that should be passed to his offspring...Bred to top notch females, you should expect many champions." -- Comments from biopsy report completed at 30 months of age (see more on Ganymede's web page). He is the 2017 AOA National Light Male Supreme Champion! 4X Judge's Choice + 11X Color Champion + 1X Best Bred & Owned at 29 months old & breeding! We invite you to our farm to take a look at her in person. She's quite the head turner, and she'll undoubtedly add gorgeous conformation along with great fleece characteristics to her future offspring! Since we are refocusing our breeding program to white, light and fawn, we are also offering tremendous discounts on color package sales. 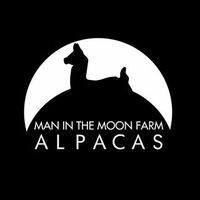 Note: Special pricing available for multiple alpaca purchases. Keltie is also listed in our package deal!